She’s pretty sure that something isn’t Jericho, the too-hot surfer with amazing blue eyes. He’s way out of her league. And is that an actual electric spark that happens every time she touches him? She doesn’t have time for him—not with two jobs, a boozer neighbor, and her best friend’s stalker on the scene. Not to mention the weird black mist over the water or outside her workplace that no one seems to notice but her. But there’s more to Jericho than Kris realizes, and she can’t blow him off so easily. He’s in tune with the magic of the tides, and only he knows of the evil that’s washed ashore and is coming for her. The closer Kris gets to him the more danger she’s in. But he can’t let her be—he’s been waiting years for her. Paranormal Romance is one of my favorite genres. I'm drawn to the mystery of what the paranormal aspect is going to be in each book I read. There is an ever growing list of possibilities it can be, especially now a days. 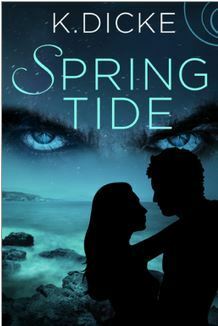 Spring Tide, was a pretty good paranormal romance. It was different, not like any other PR (Paranormal Romance) I've ever read. Kris just graduated high school and is staying in a beach house with her best friend before college. Like every other high school graduate, she has no idea what to do next. She's not quite ready for college but is too smart and talented to waste away and do nothing. She meets a hot surfer named Jericho. He manages to get her to drop her guard and fall for him. The truth about him and Kris is about to come out, can he keep her safe, when the person after her has already made his move? This book might be good but it wasn't great –it didn't make it to my favorites list. I got confused a lot when there was a conversation going on. It was easy to get lost and not know which character was speaking. Obviously, I caught on quickly but it happened throughout the entire book. I enjoyed the storyline, it was different and I'm glad about that. It was refreshing to read a book that wasn't the same old, same old. I love how smart Kris was! She had a full-ride scholarship, I can't believe she would take time off school but she had a full-ride! I don't know anyone that would take a break from school if they had a full ride but to each their own. The characters didn't really seem to connect with me. I just didn't feel like they were as close as their relationship was being described to me. With the exception of Kris and Derek, I felt their friendship and I could also tell Kris liked him more than just a friend. For some reason I just wasn't really feeling Jericho and Kris' relationship. I don't know why but I just didn't. I did like how protective he was of her though. I am a very fast reader, it usually takes me a couple of hours to speed through a good book. But with this book, I felt like I was reading forever! I was beginning to think I was never going to finish it. Even though it really only took me a day and a half to get through it, it felt like so much longer.